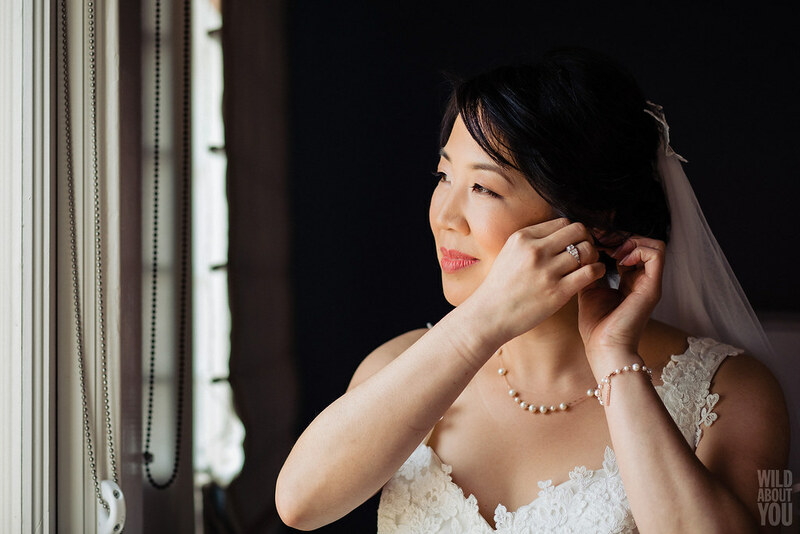 The number eight is considered lucky in many Asian cultures, so it’s hard to come by a more auspicious date than 8/18/18. 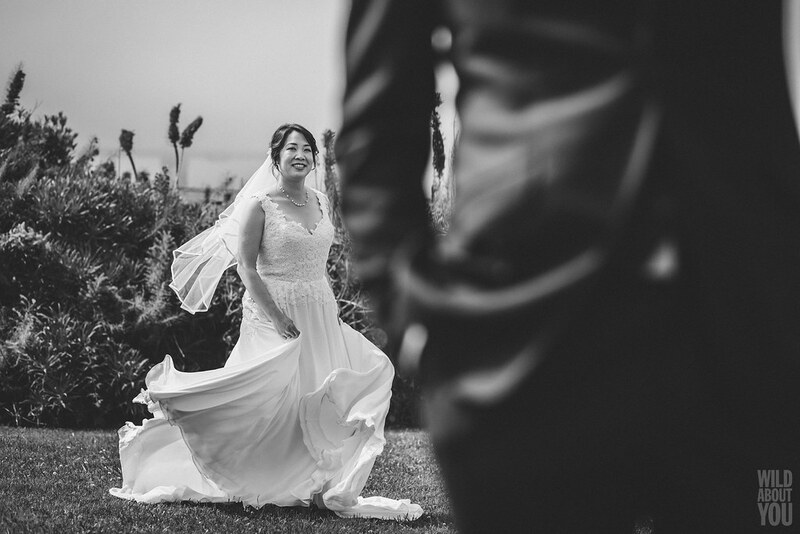 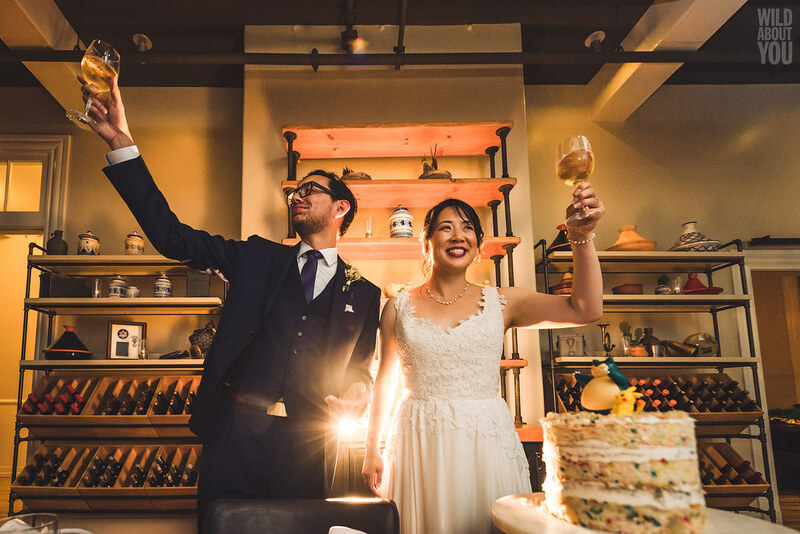 For Angela and Lark, it was seriously the best day ever! 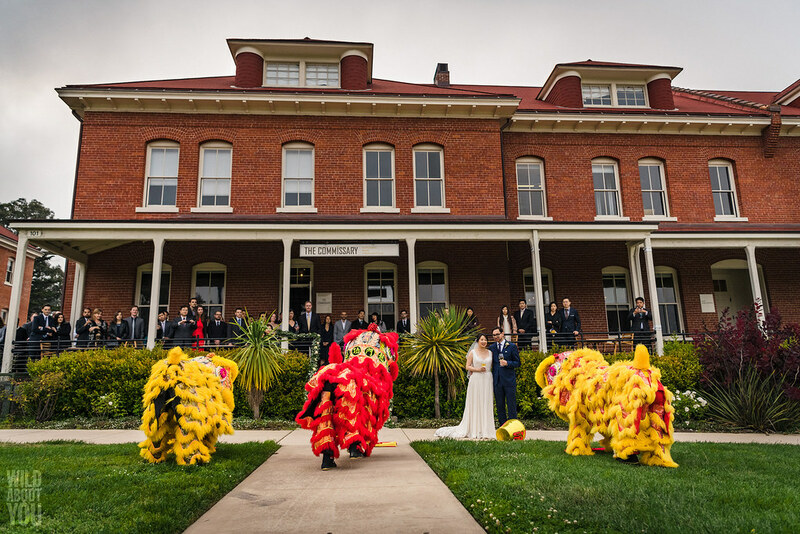 Happily for them, The Commissary is located in a historical barrack on the Presidio’s Main Post, which features several attractions and services. 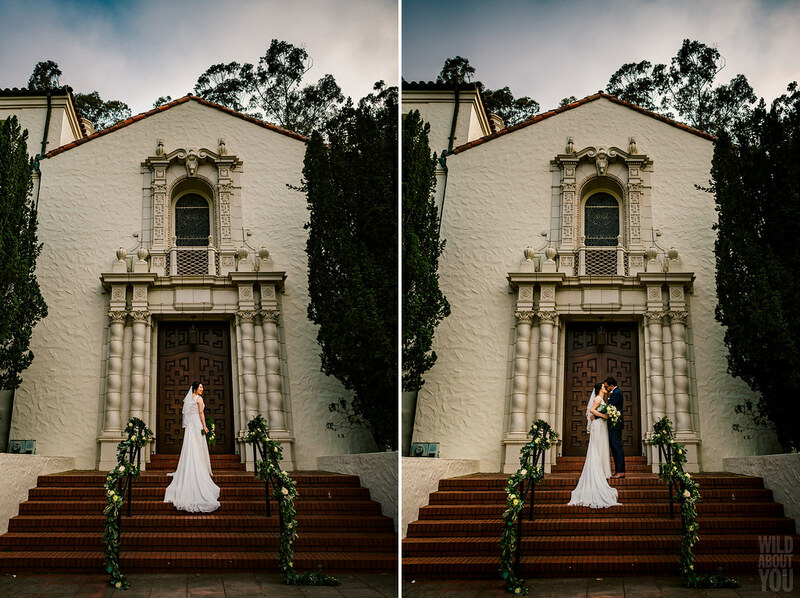 “The Presidio Chapel was beautiful and within walking distance of The Commissary, so that sealed the deal,” says Lark. 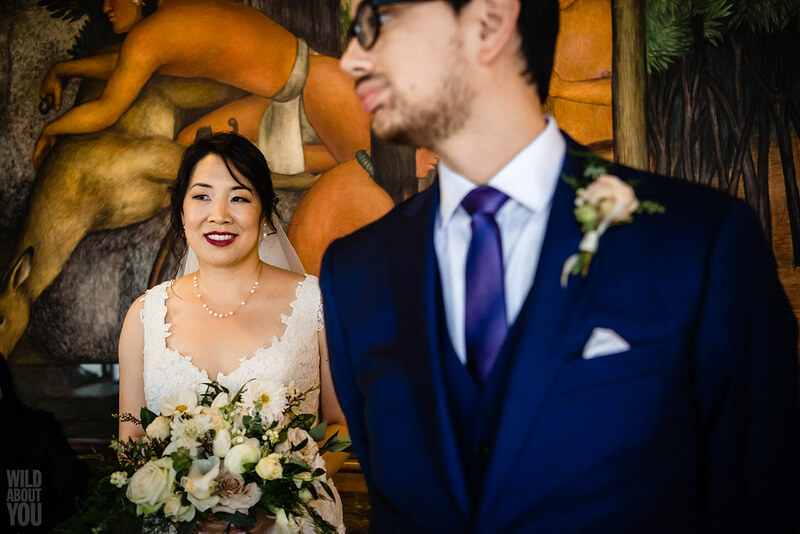 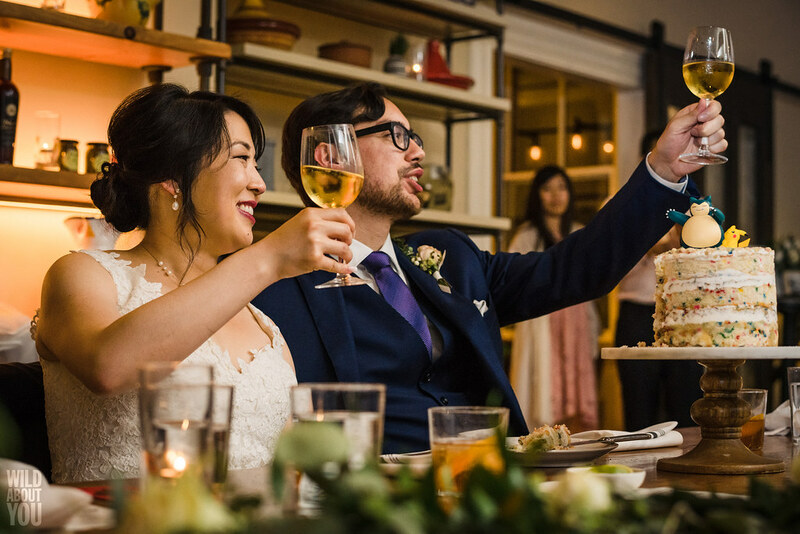 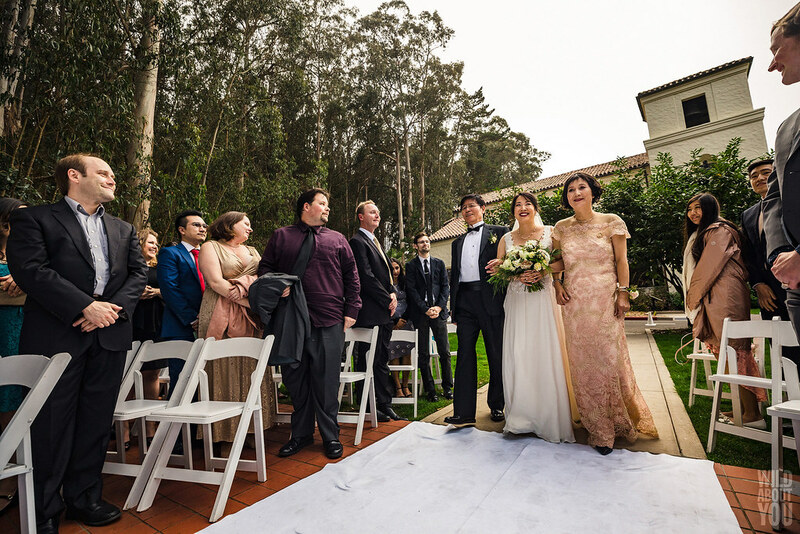 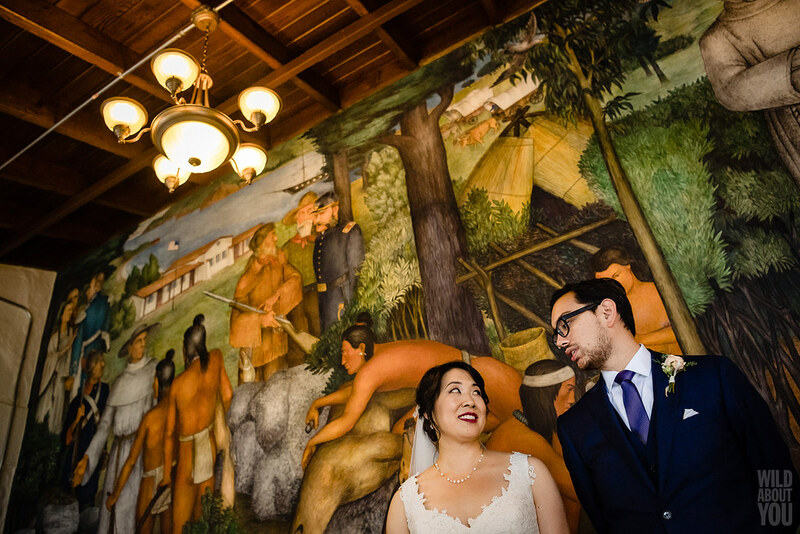 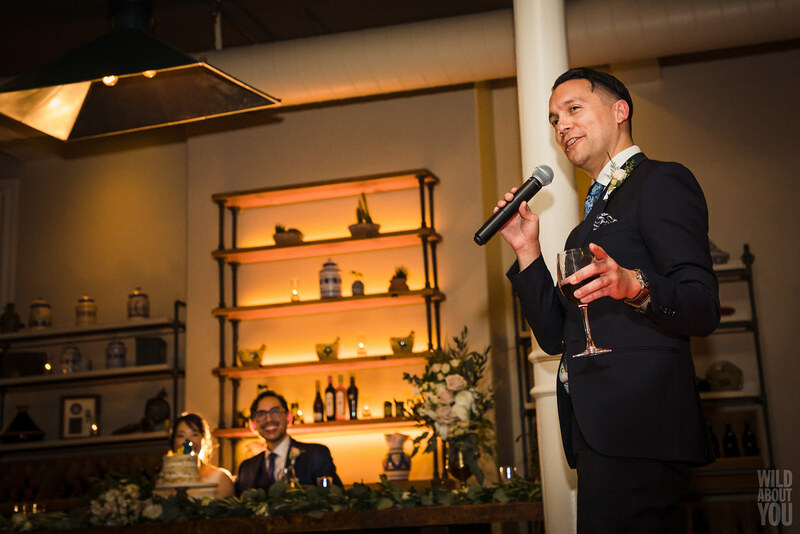 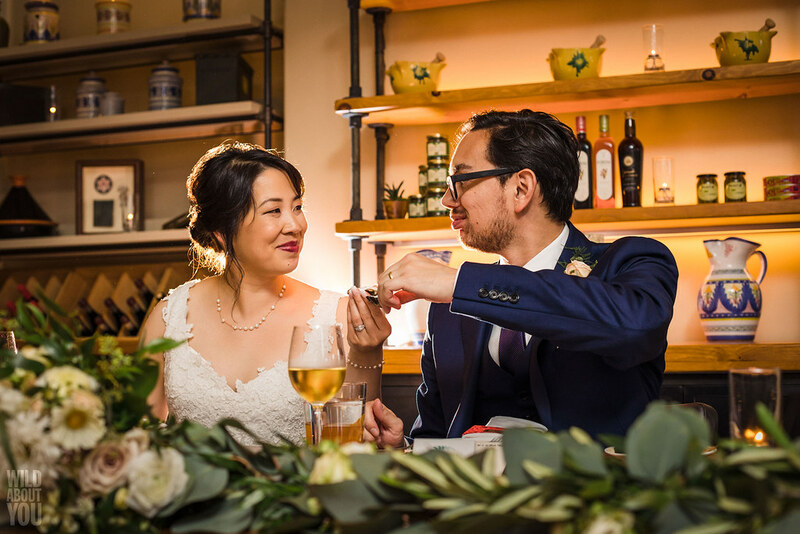 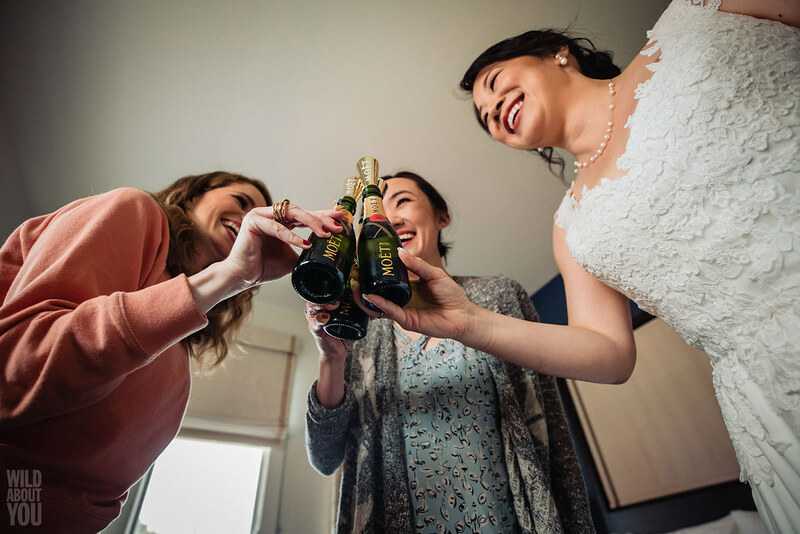 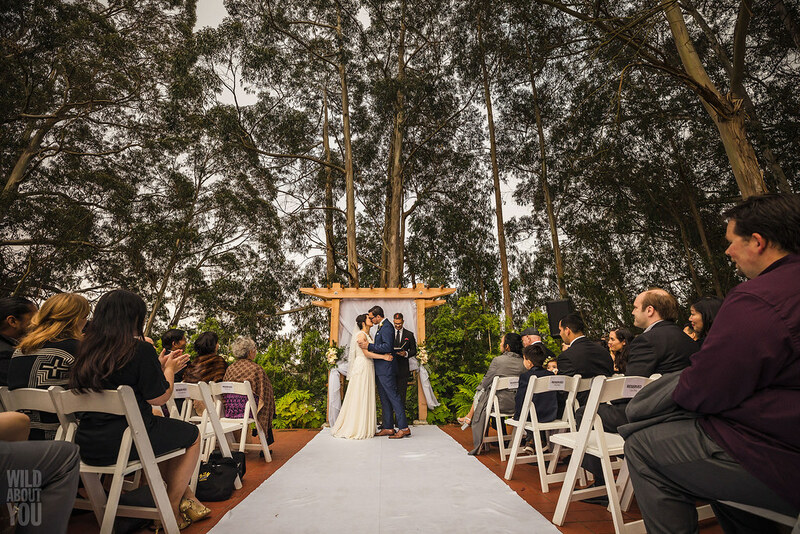 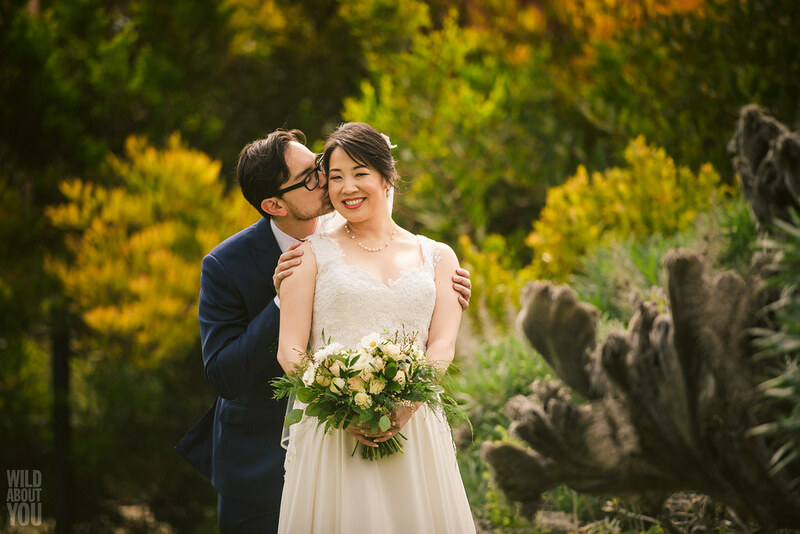 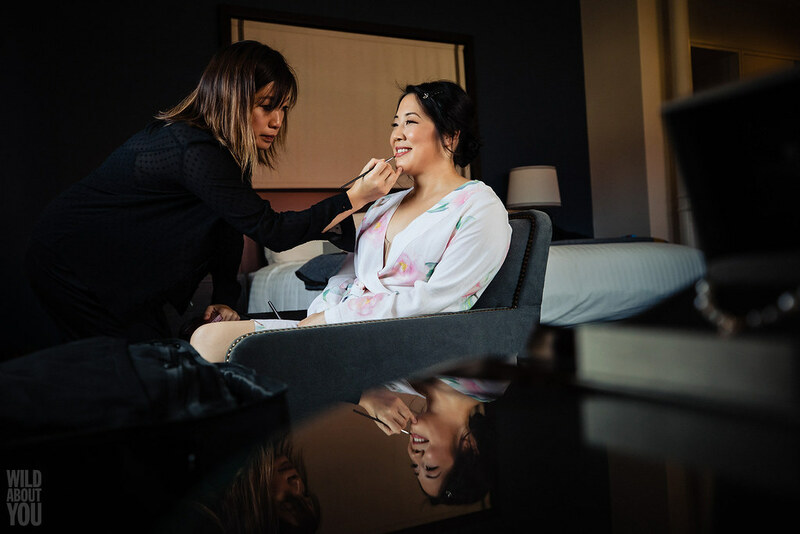 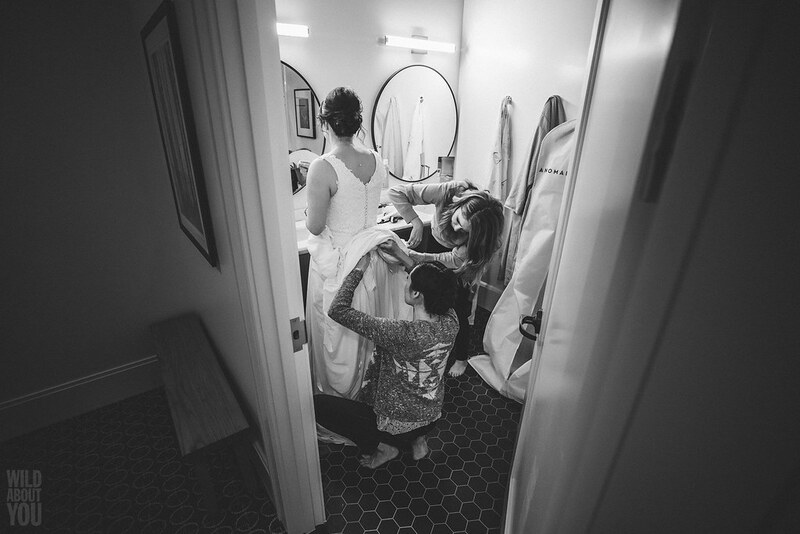 In addition, the newly opened Lodge at the Presidio at the end of the block, with views of the Golden Gate Bridge and the San Francisco skyline, was the perfect hub for their special weekend. 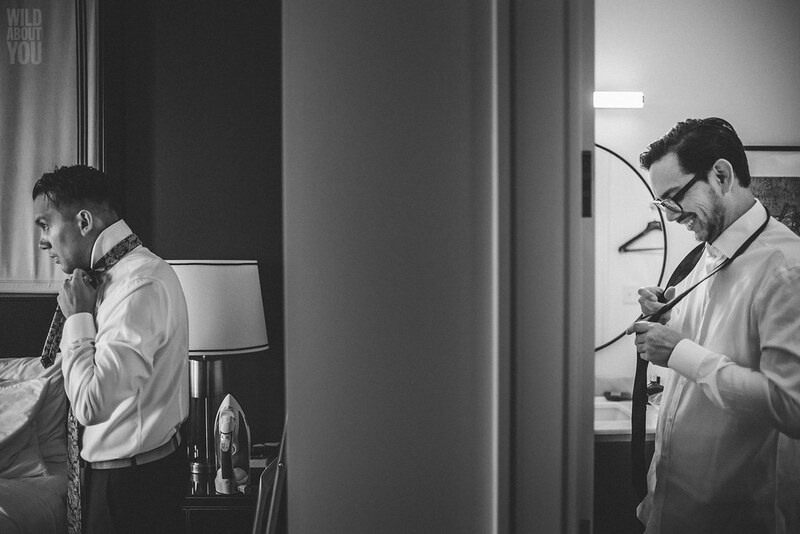 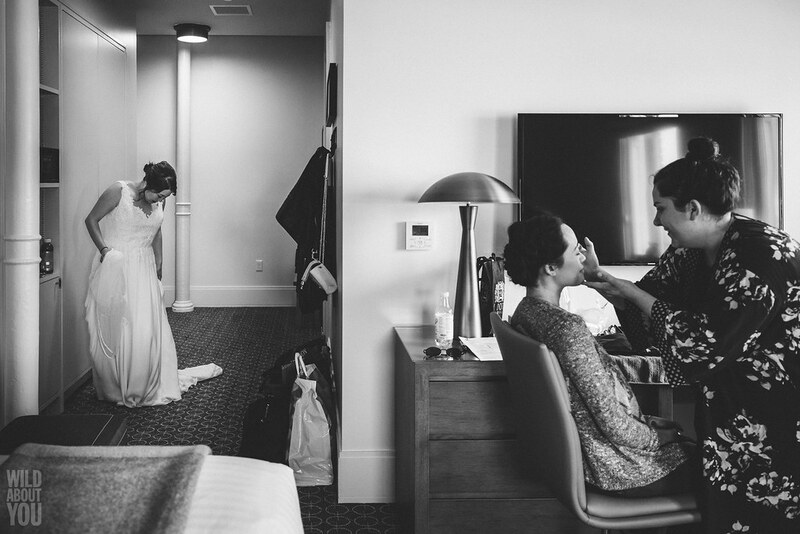 We joined Angela and Lark there as they got ready in separate rooms. 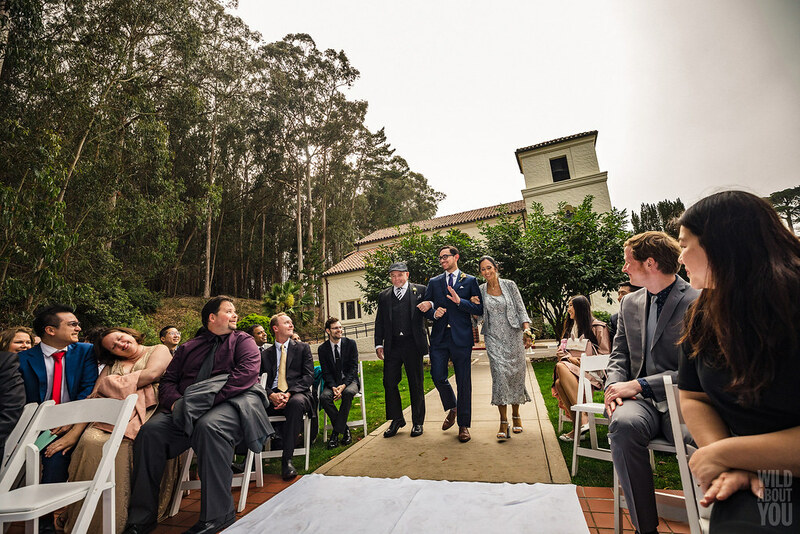 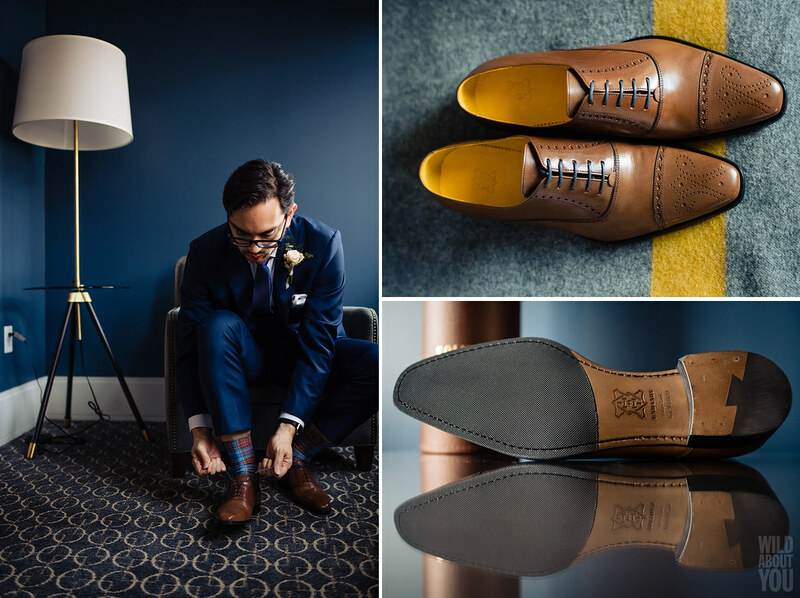 Angela beamed in a lovely custom floor-length gown paired with bespoke navy satin shoes adorned with gold accents, while Lark rocked a navy suit that was complemented by socks in his family’s tartan, a purple/blue tie, and custom brown leather shoes. 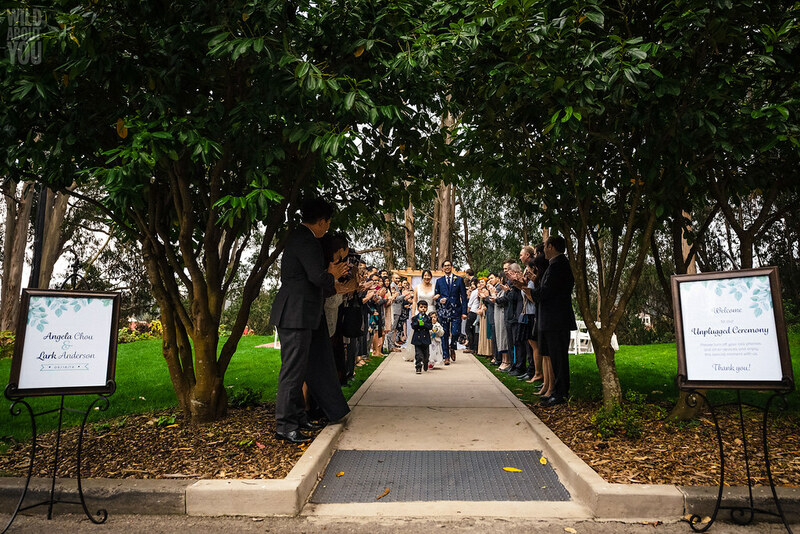 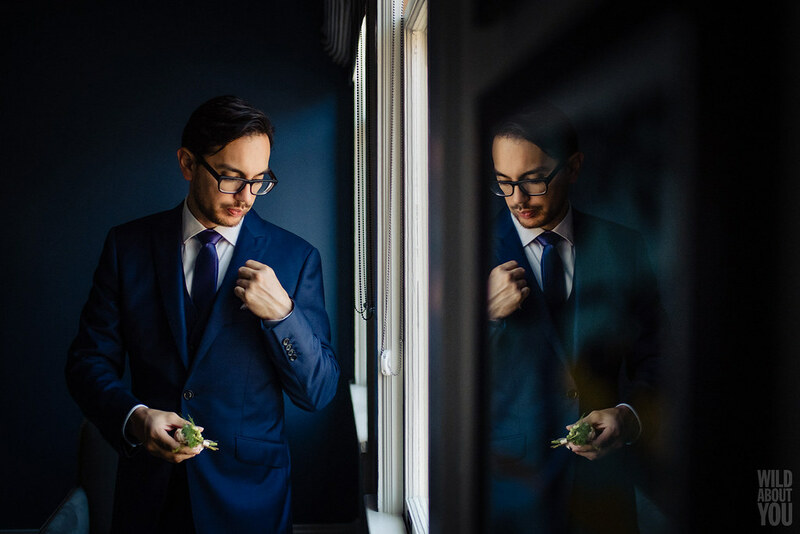 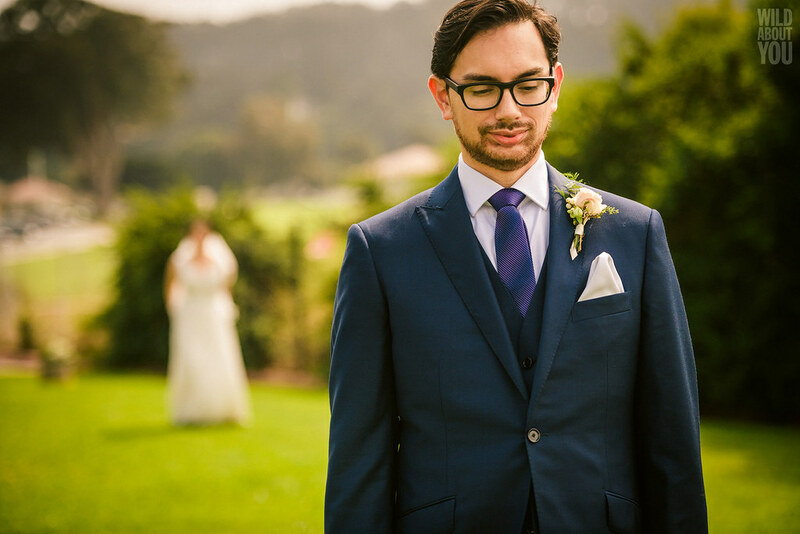 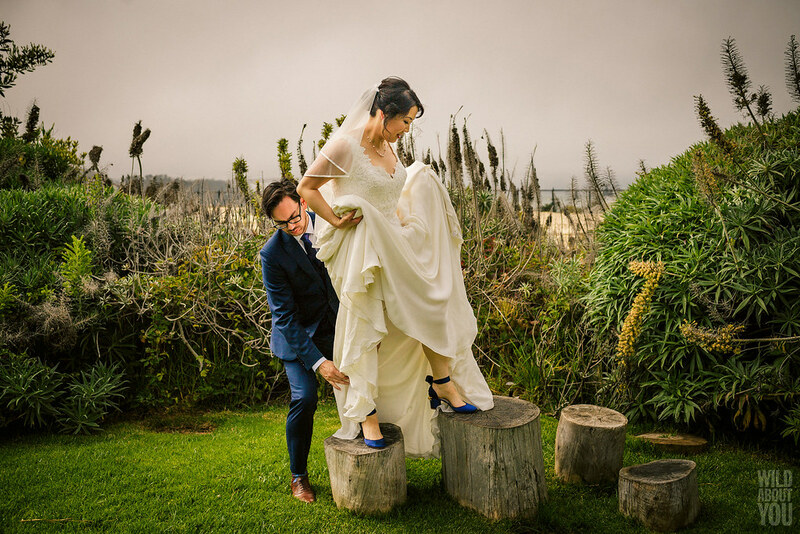 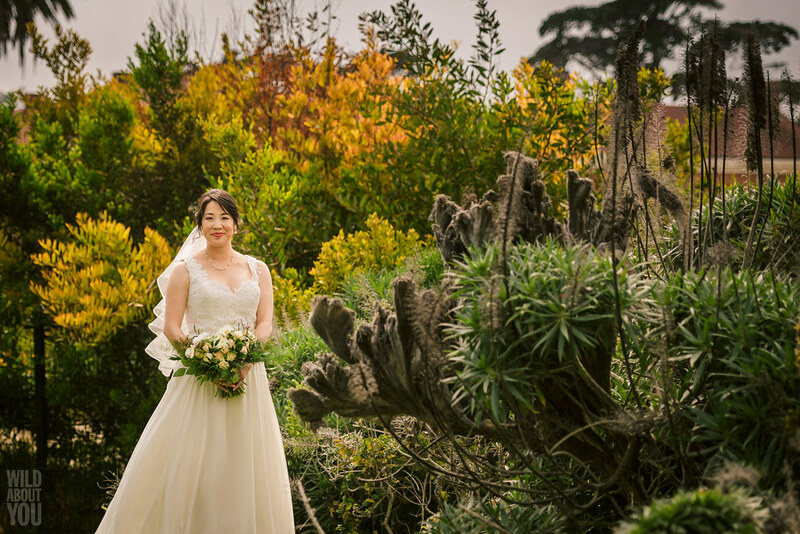 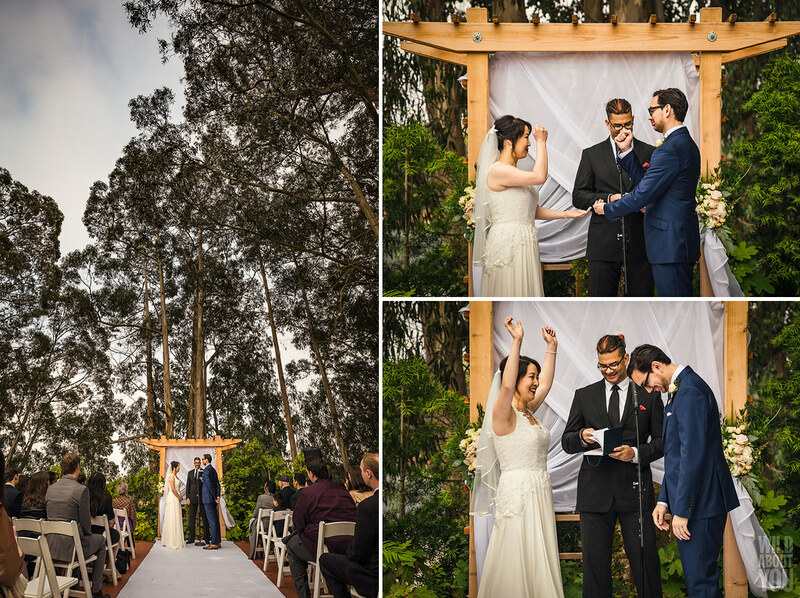 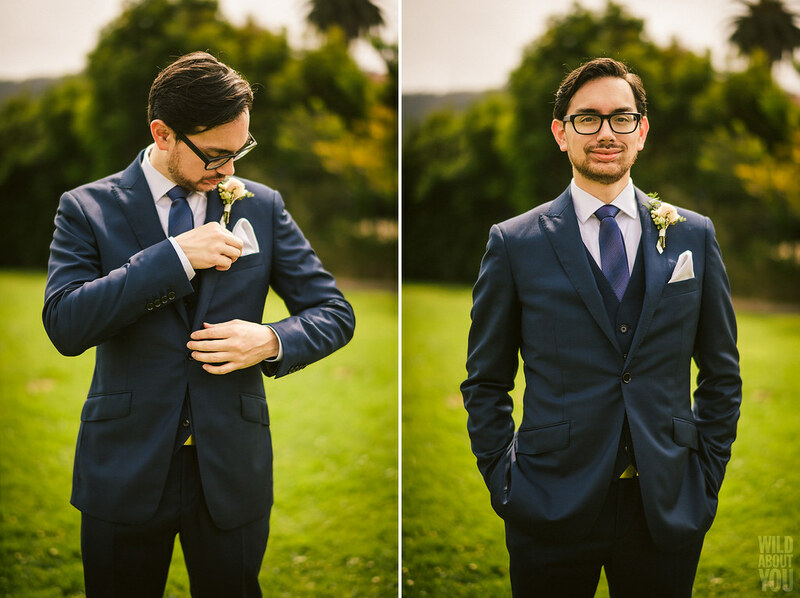 After their first look at a secluded spot overlooking a fog-shrouded Golden Gate Bridge, they were ready to tie the knot in the tree-lined lawn adjacent to the chapel. 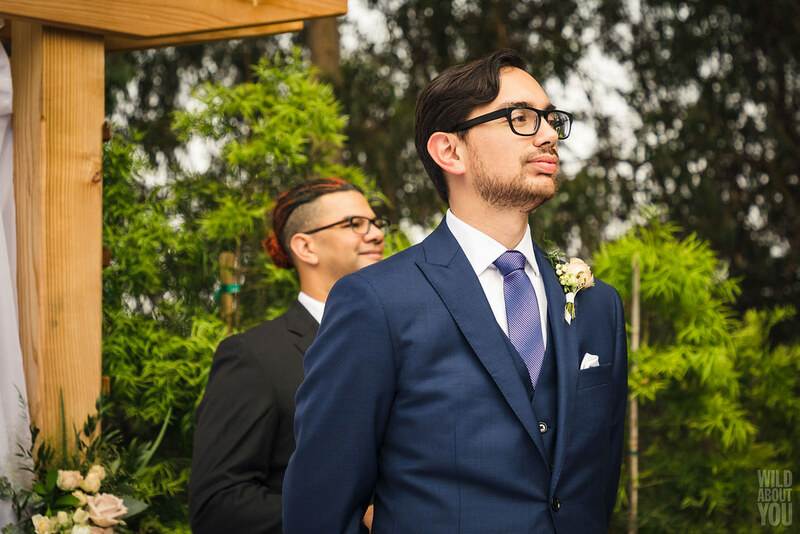 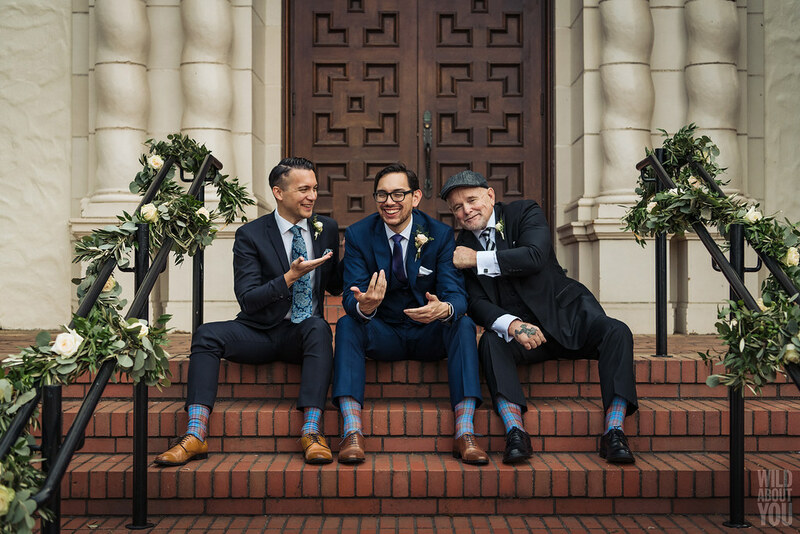 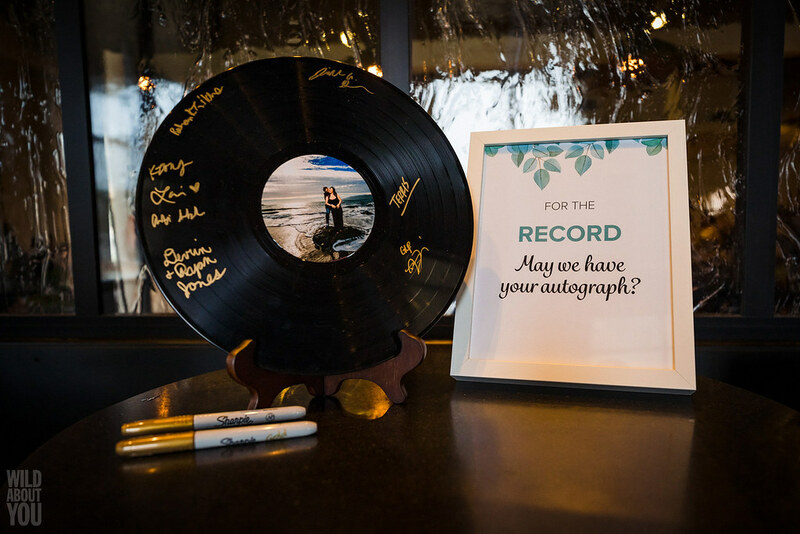 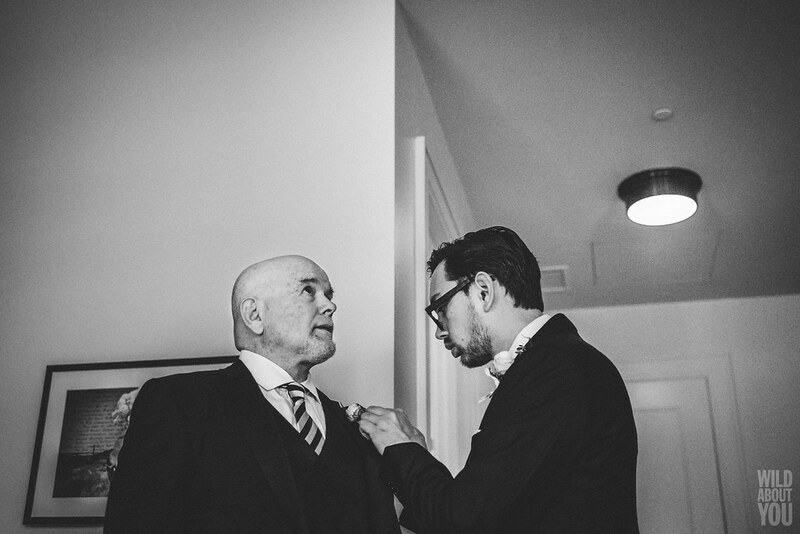 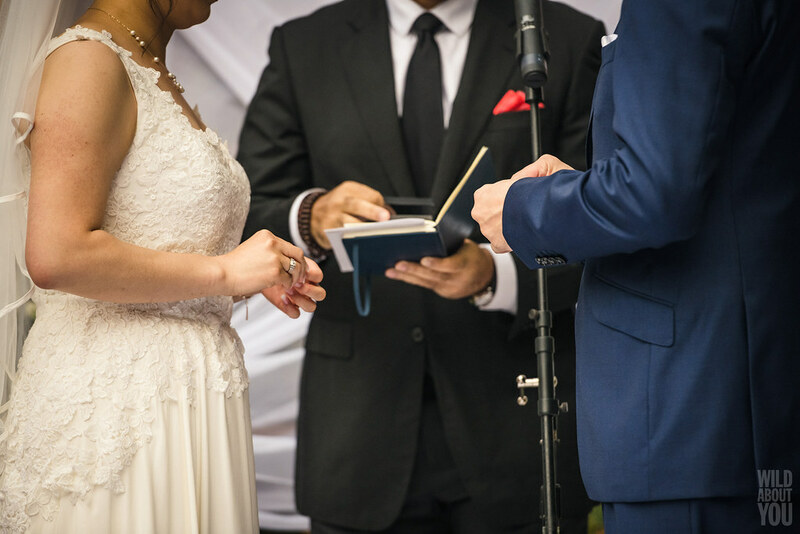 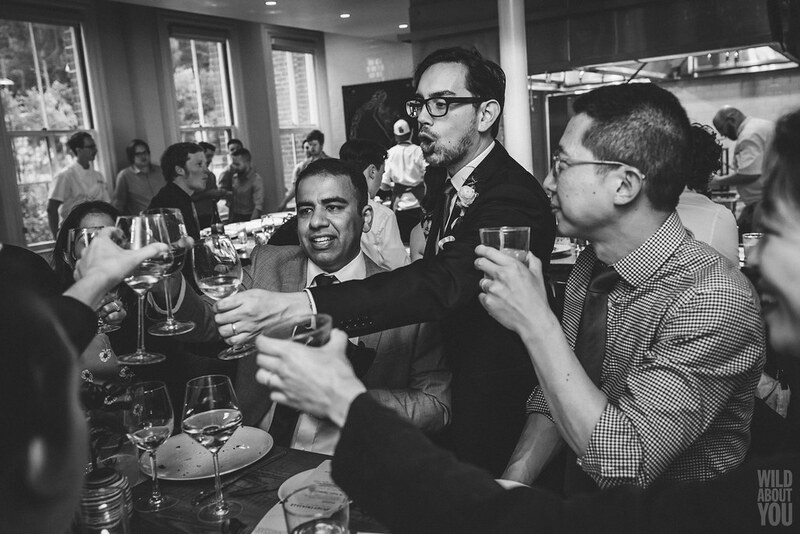 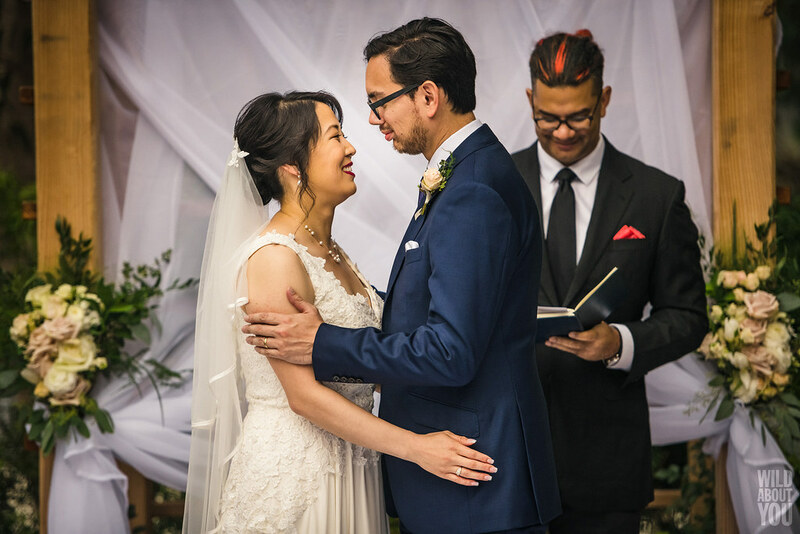 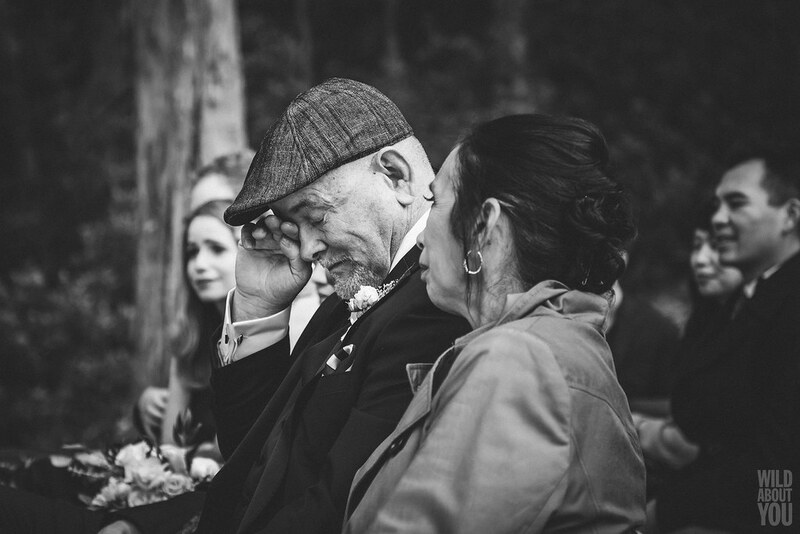 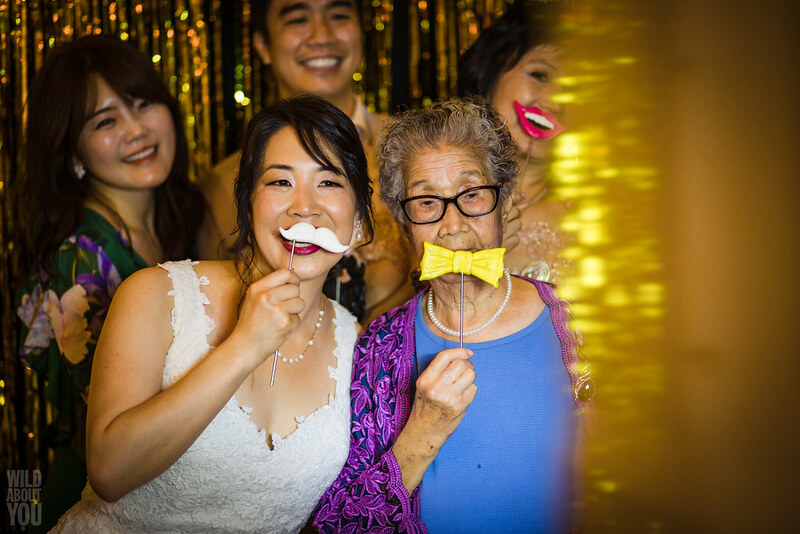 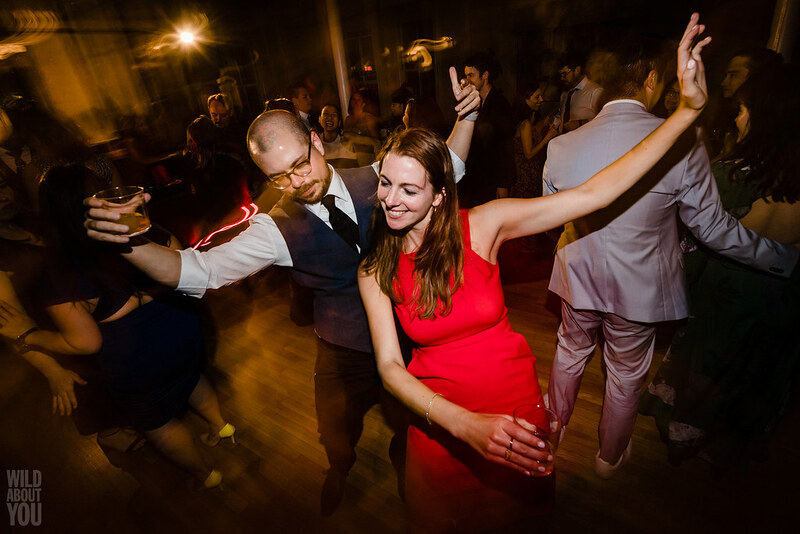 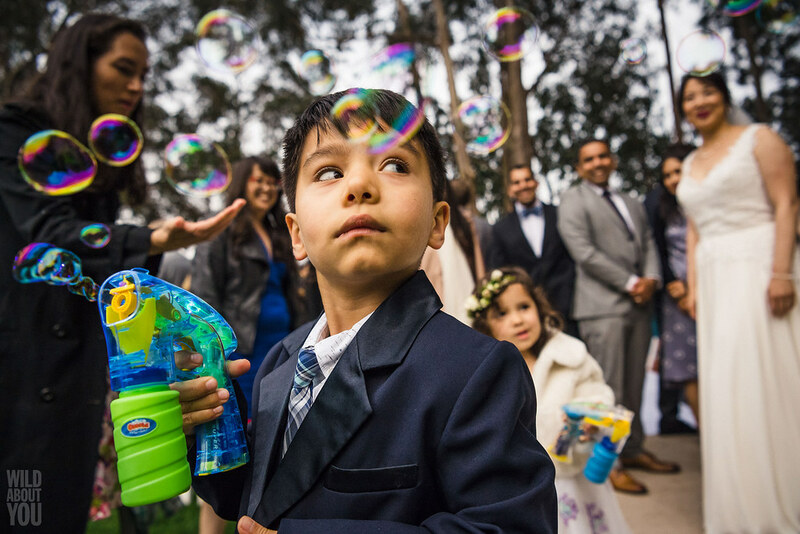 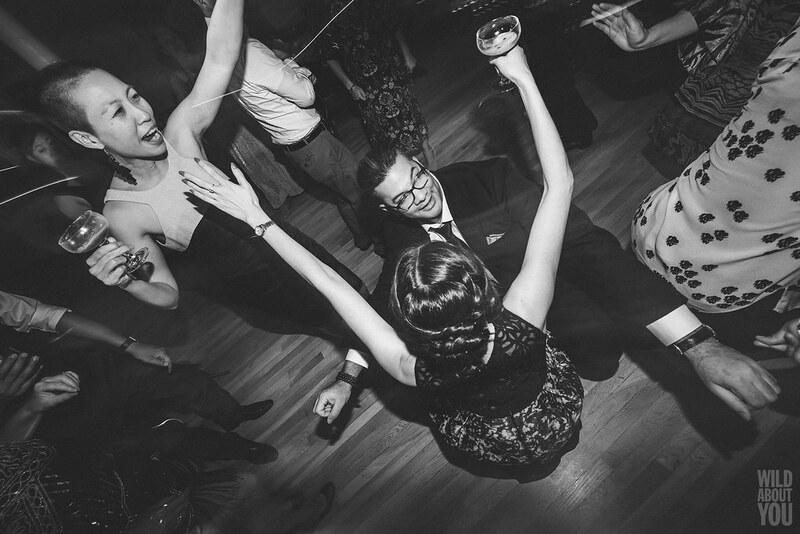 We love that they chose songs from Aladdin and Up for their ceremony, which brimmed with love, laughter, and tears. 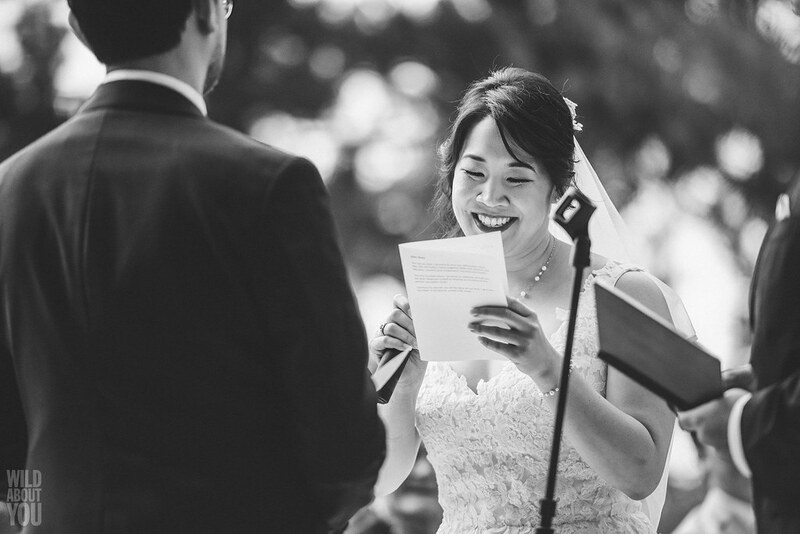 It was also our first time witnessing a game of rock/paper/scissors to determine who’d say their vows first (Angela won). 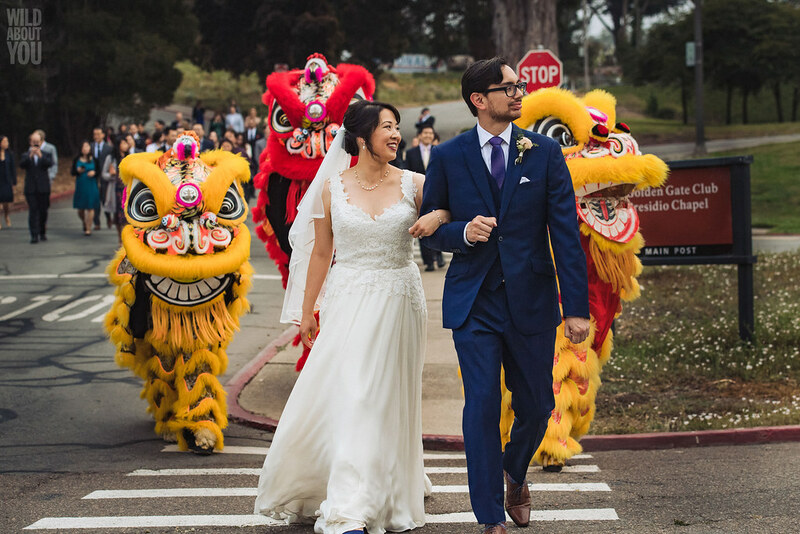 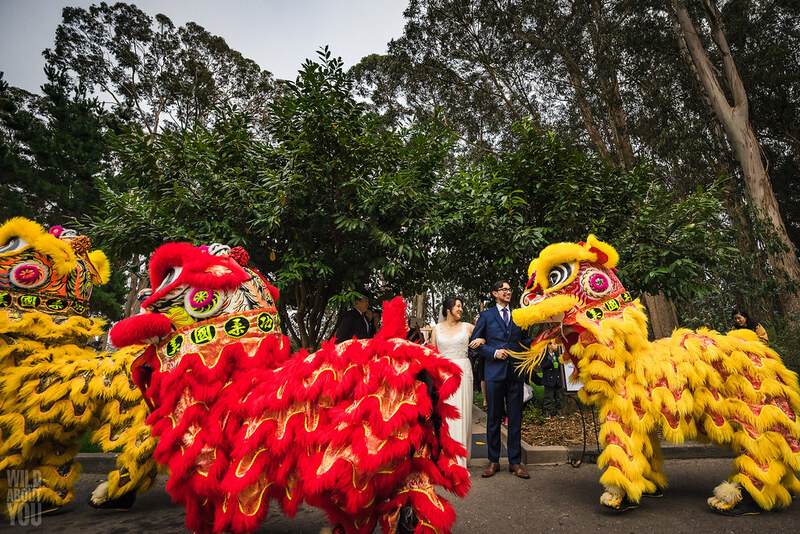 To the guests delight, lion dancers appeared after the ceremony and helped lead the way to The Commissary for the reception, where they performed and brought good luck and fortune to our newlyweds. 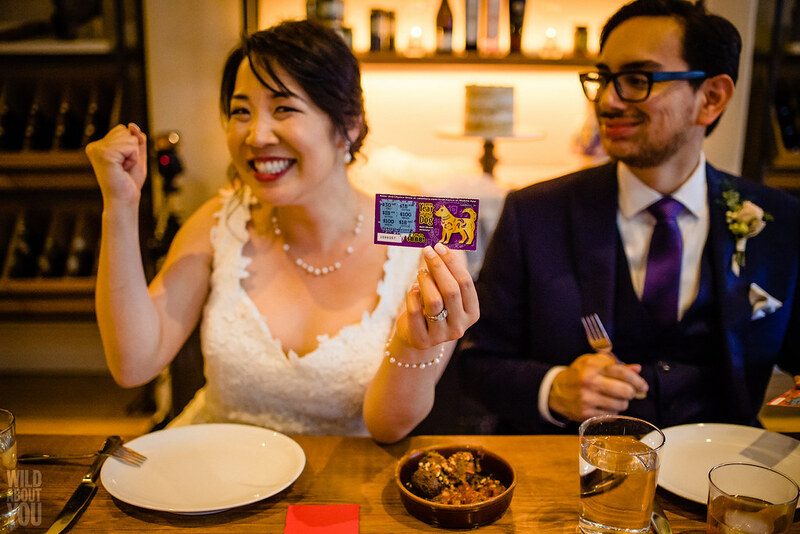 In keeping with the auspicious theme, the table settings featured red envelopes stuffed with Year of the Dog Scratchers tickets (amazingly, Angela won $18 with her ticket!). 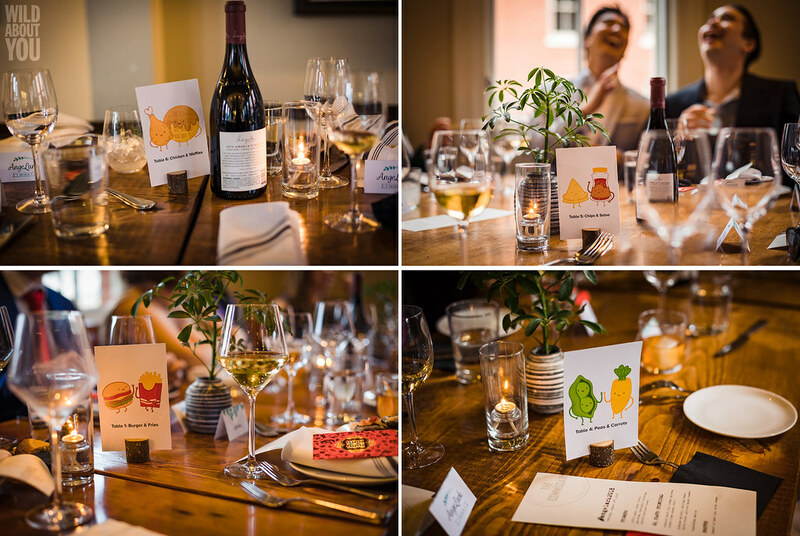 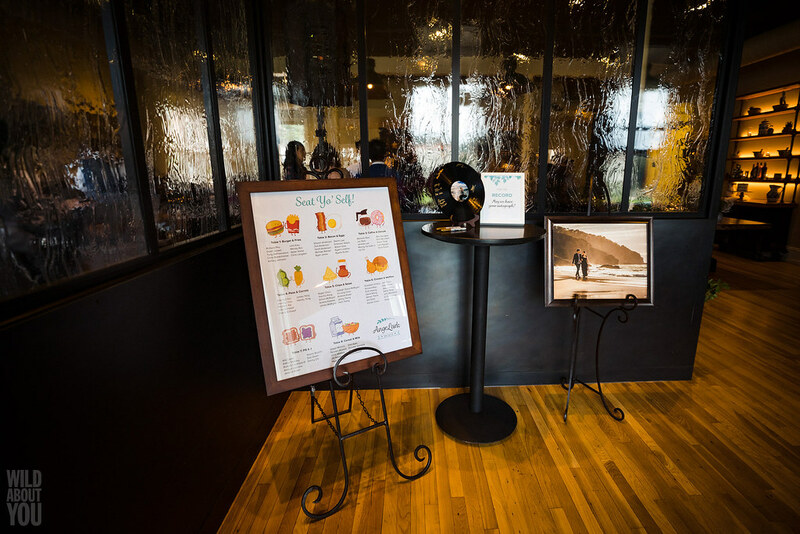 Cute illustrations of popular food pairings (e.g., chicken and waffles) served as table numbers. 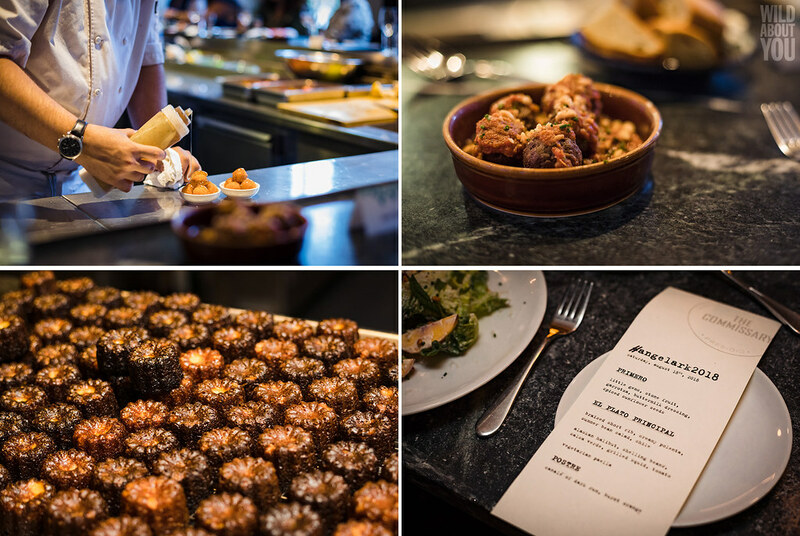 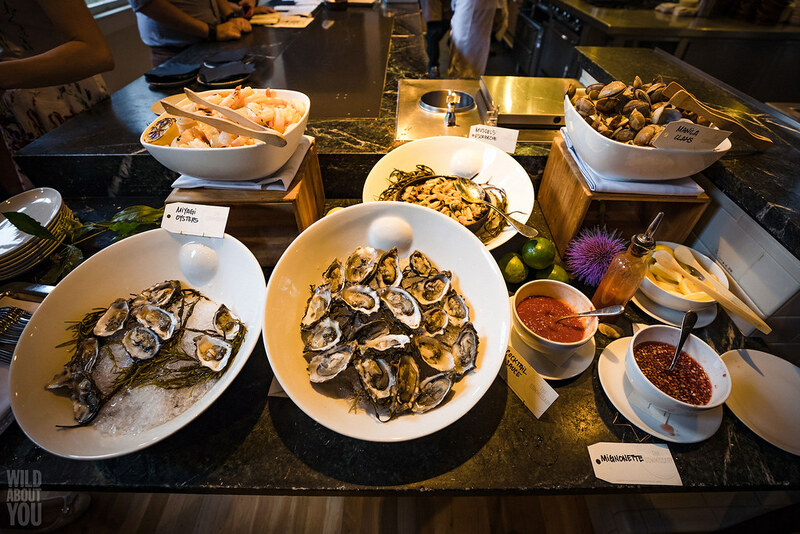 Unsurprisingly, the Spanish-inspired food—from the self-serve seafood bar to the exquisitely prepared entrées—was incredible. 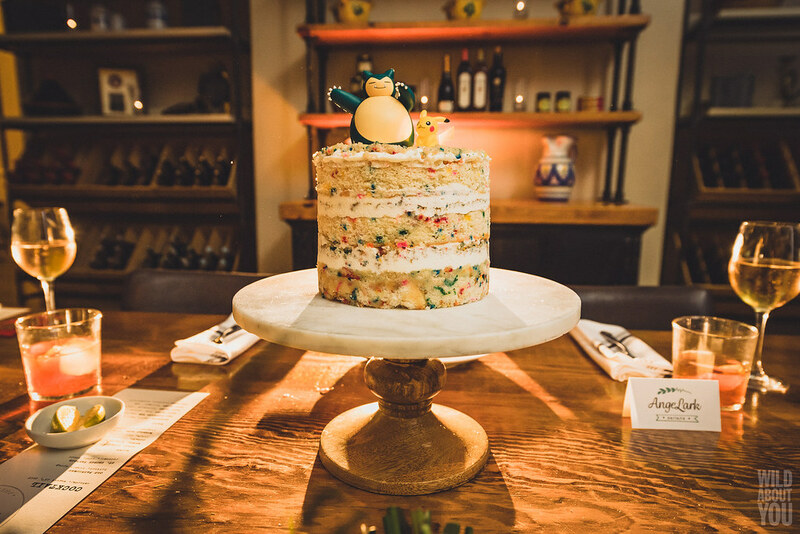 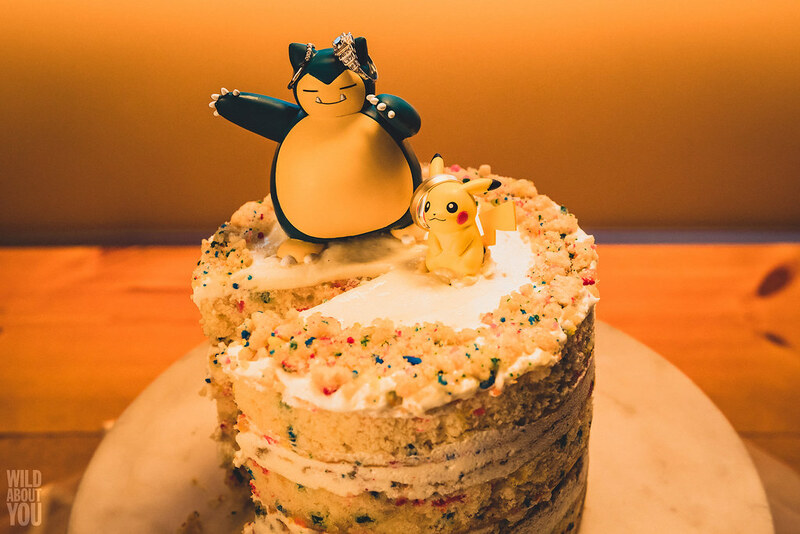 Lark, an amateur baker, showcased his talent by making not only a funfetti cake (technically Momofuku Milk Bar Birthday Cake, topped with Pokemon characters Snorlax and Pikachu) for him and Angela to share but also mini macarons as favors for all their guests. 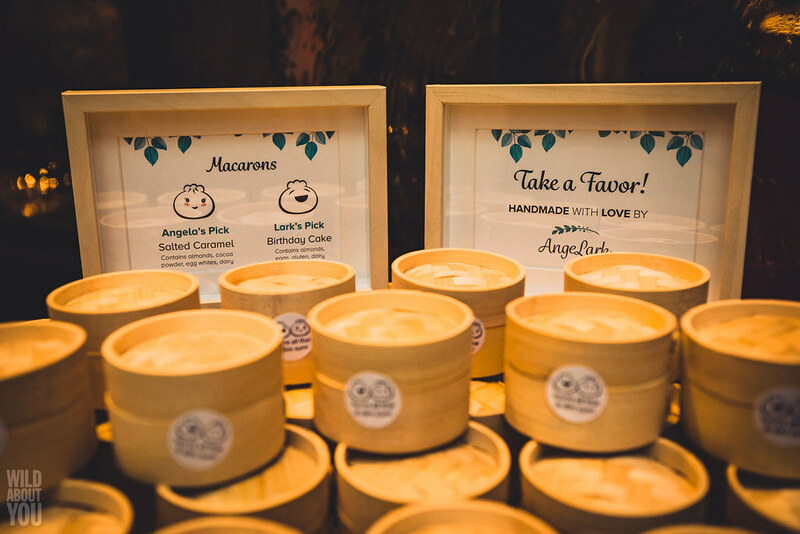 The mini dim sum steamers holding the macarons were adorable, and we were impressed by how creative and thoughtful Angela and Lark are. 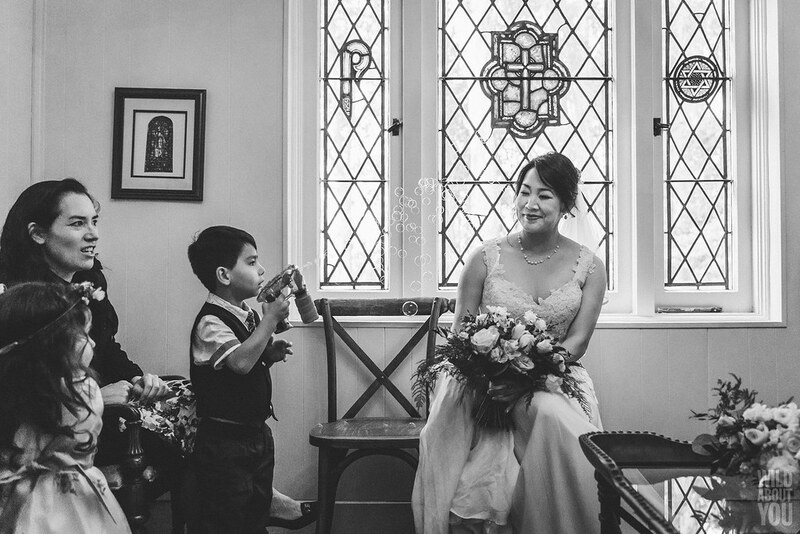 And mischievous! 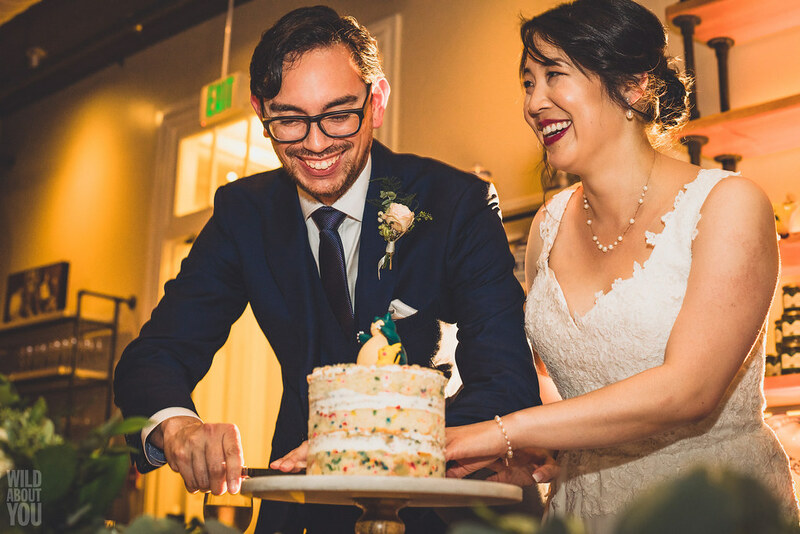 Who else would choose the song from Game of Thrones‘ “The Red Wedding” to cut their cake to? 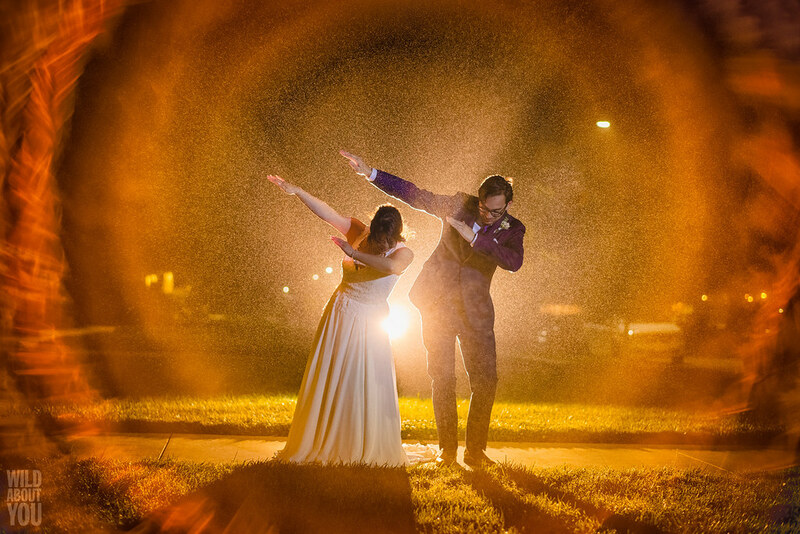 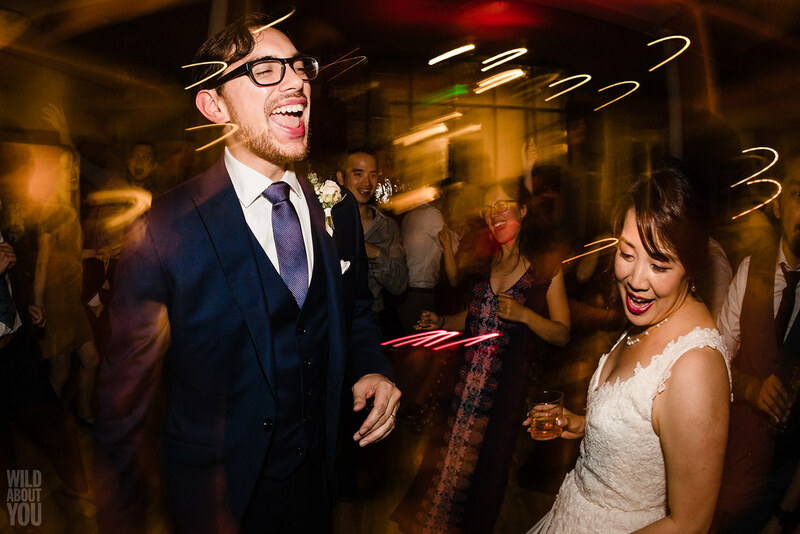 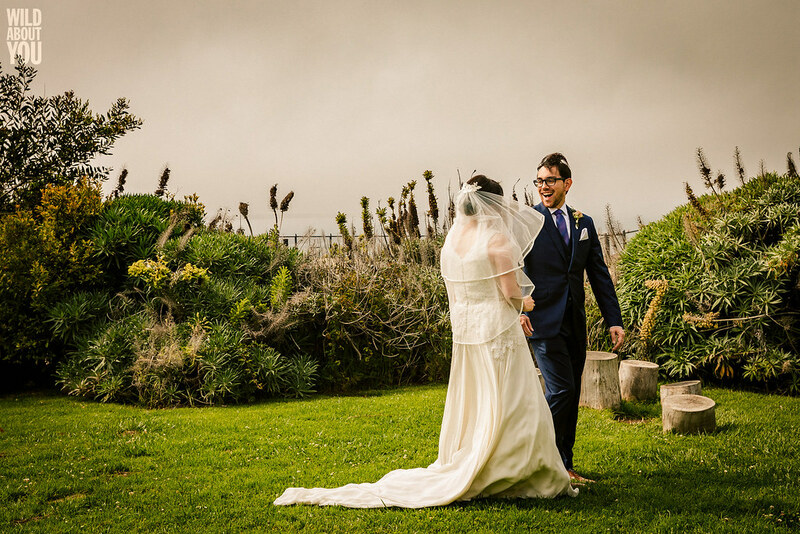 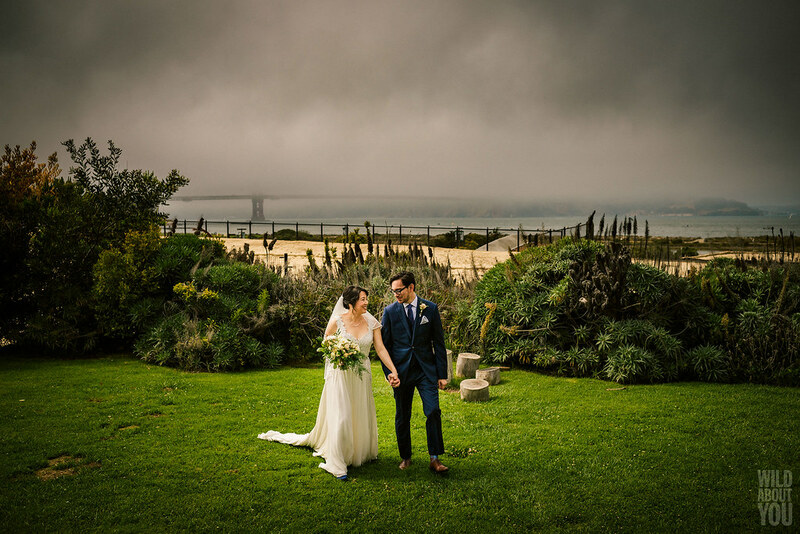 Before we knew it, it was time to say goodnight—but not before we captured the newlyweds dabbing in the fog that was quickly cloaking the Presidio. 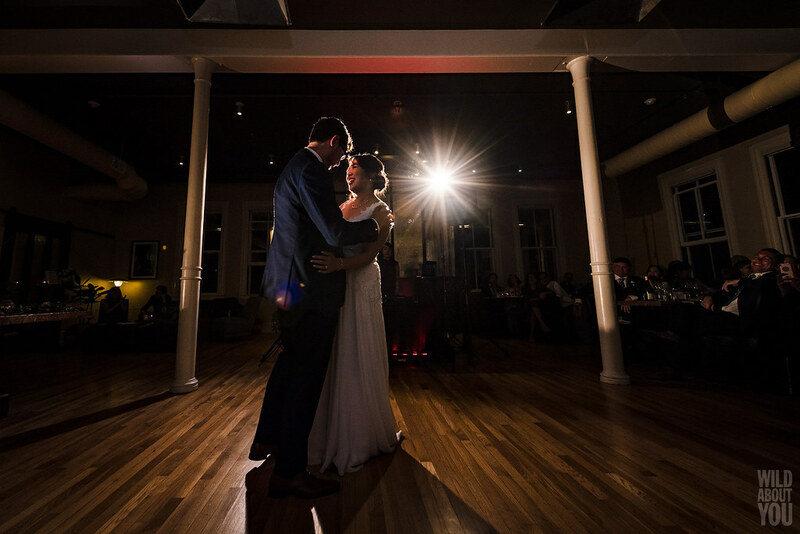 What a fantastic way to end a fantastic day! 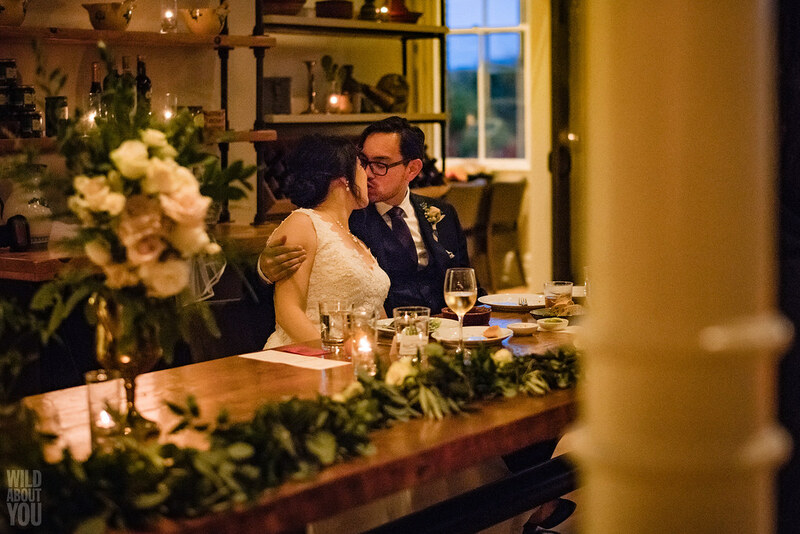 Here are some of our favorite moments.